Brighton; famous for it’s pebbled beach, sticks of rock and also the prospect that every individual you brush shoulders with on the promenade is a potential member of your new favourite up and coming band. The buzz in the small seaside town is eternally effervescent, however the bulk of musicians spilling out of its borders makes it difficult to find the diamonds in the rough. Presenting Thyla, a post-punk-pop quartet birthed from the beach who are set out to diffuse the confusion between alt-rock and the new romantic. Fronted by Stateside songstress Millie Duthie and compiled of Danny Southwell, Dan Hole and Mitch Duce, the outfit began churning out ditties in 2016, citing inspirations such as indie staple Bombay Bicycle Club and the ethereal queens of Warpaint. 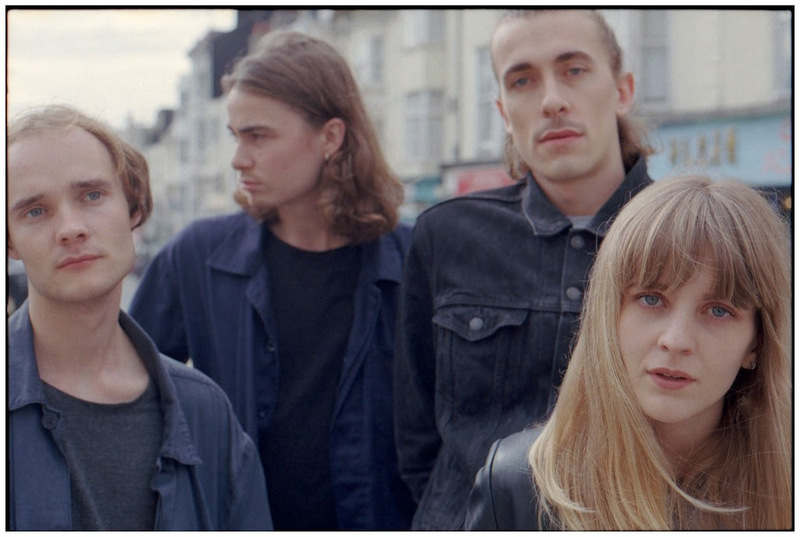 After securing support slots for Sunflower Bean and Fickle Friends (amongst an array of festival billings), the four piece are igniting waves as rapturous as the ones against the helter skelter by the pier. In a civilisation where our eyes are superglued to the shiny brick in our palms and every passing thought that crosses our brain has to be shared on the social media stratosphere, Thyla are taking a stand against the norm that is frazzling our creativity, privacy and most importantly, our minds with their latest release. “The title of our EP ‘What’s On Your Mind?’ is the prompt Facebook gives you to write a status. All of the songs on our debut, in some way, talk about the ills of today’s social network,” Millie explains, “the lyrics are based on negative personal experiences and a subsequent thirst to understand what it is that has made us so miserable”. Knowing that each and every one of us has had that bead of sweat rolling down our foreheads after a hefty night out on the tiles when we realise we’ve documented our extensive warbling to Shania Twain on karaoke, the constant fear of how we are being projected online consumes us like the amount of Jagerbombs we regrettably did on top of that. Alongside the release of their hotly anticipated debut EP, the band are about to embark on their first headline tour with New York City’s punk extraordinaires Bass Drum of Death. “We love touring; being on the road is probably our collective favourite part of band life. We’ve got some awesome shows lined up this year, including our UK headline tour, we have slots at Live at Leeds, Hit the North and we’ll be making our debut at SXSW in March!” gushes Millie.